MomsRising.org | Play Healthy Mom BINGO with us! Play Healthy Mom BINGO with us! 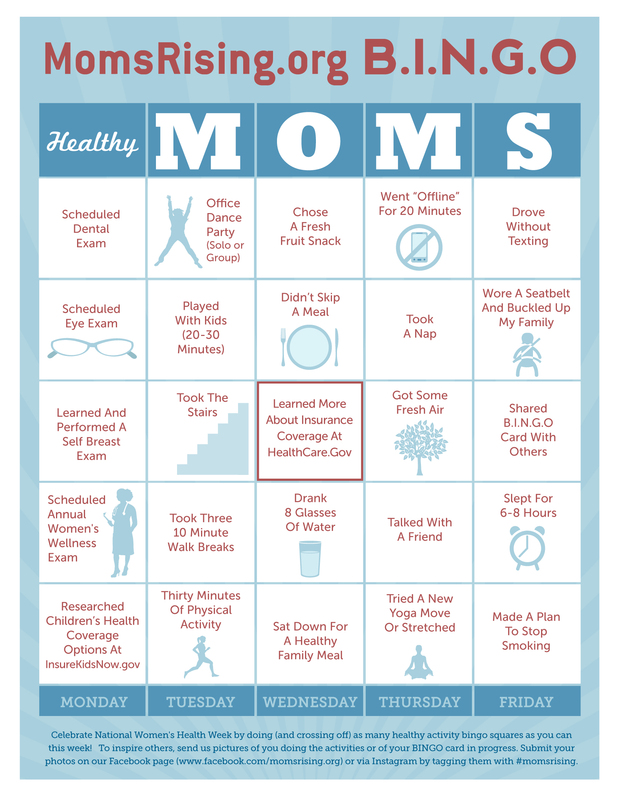 This year, MomsRising is celebrating National Women's Health Week by playing Healthy Moms BINGO! The MomsRising BINGO card lists 25 simple, healthy activities that are small, important steps we can all take to live healthier lives. If you are in a moms' group, book group or just have a friend who wants to get healthier, ask them to join you. To share the card and info, just add their email address on the form to the right and click send! Share our BINGO card with your friends! Subject: Will you play BINGO with me for National Women's Health Week? You can also mail friends through your e-mail program.